Claire expressed concern about what we will eat this winter. She realized that our pantry is not yet full, and lots of fruit and vegetables are ripe now. She visited a local orchard and picked many pounds of blueberries, then brought them back and got them frozen. There were also apricots available. We ate a bunch, then she made a super low sugar jam with it. Usually the addition of lemon allows for less sugar and makes the canned good safe to eat. 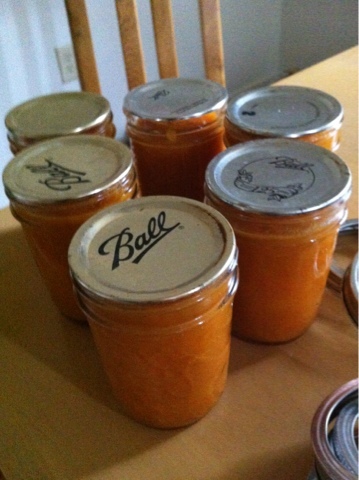 With no pectin, the result is an extraordinarily flavorful jam, just concentrated fruit flavor. We will also purchase cling free peaches in a few weeks, and can them in slices. Tomatoes too, and maybe pickles if time allows. Then during the cold months we eat a different sort of fast food: pop open a jar and eat it, quick and good. The best birthday gift!